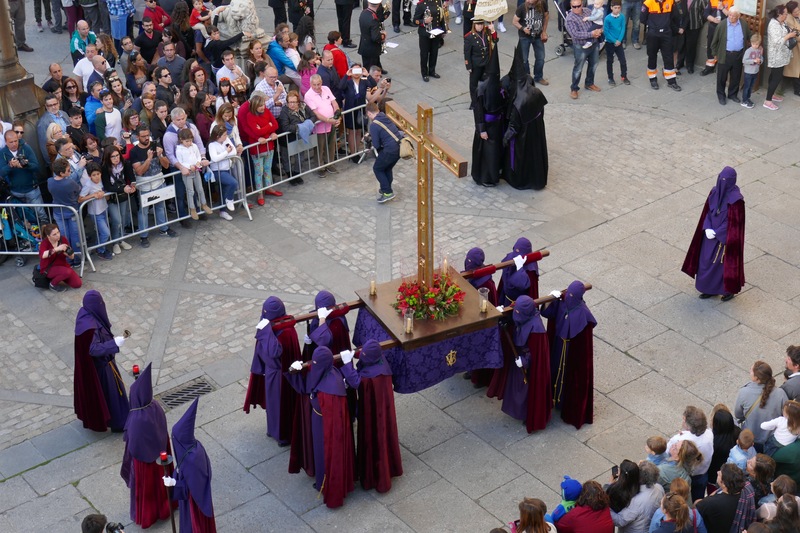 The parade on Good Friday evening was even more impressive than those preceding it. More cofraderies participated, so it was more colourful, and it had 3 bands. 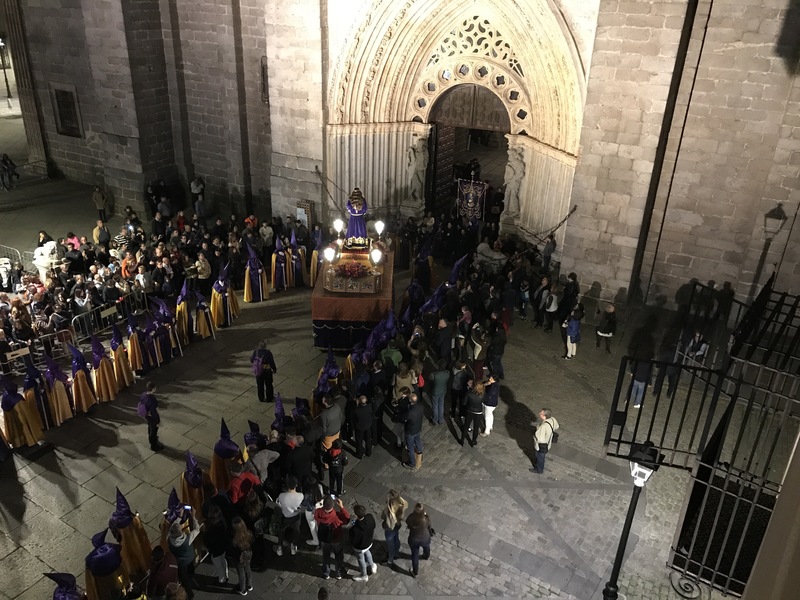 It was large enough that after it started, from within the cathedral, it was later joined by another band and more marchers who entered from a side street. 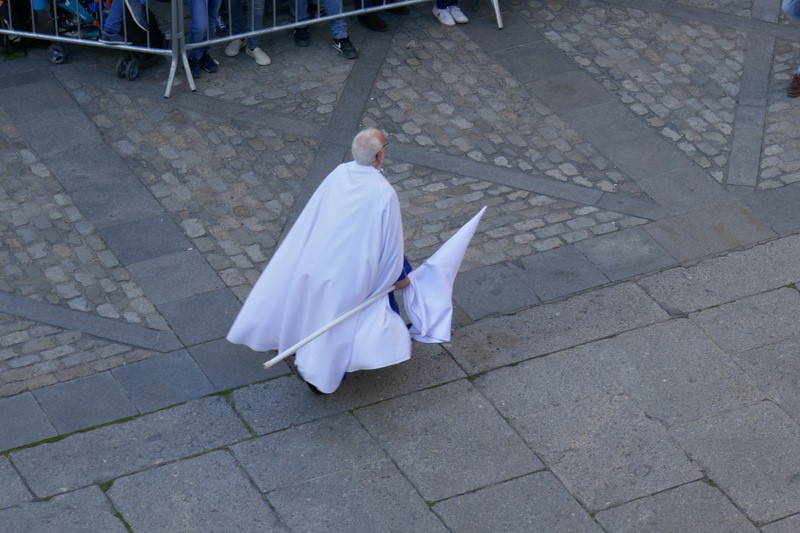 Took quite a while for the parade’s tail to leave the cathedral square. There is always someone who is late. 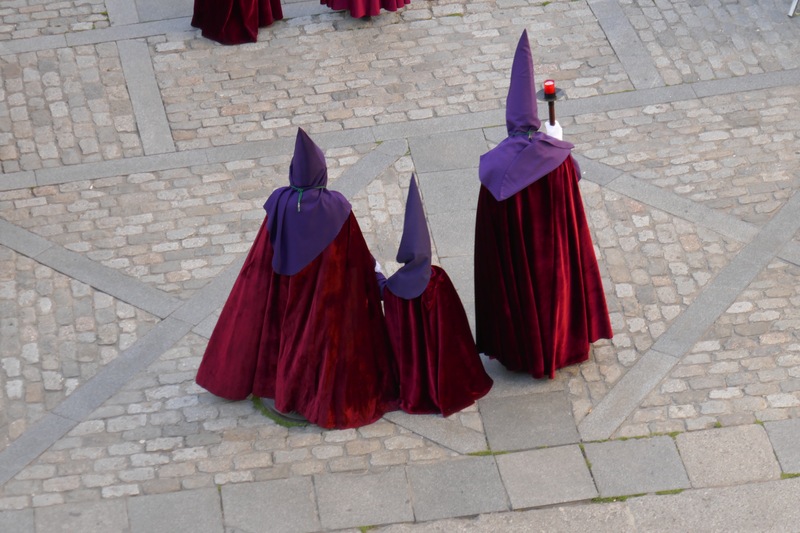 The hats apparently live on special broomsticks….. 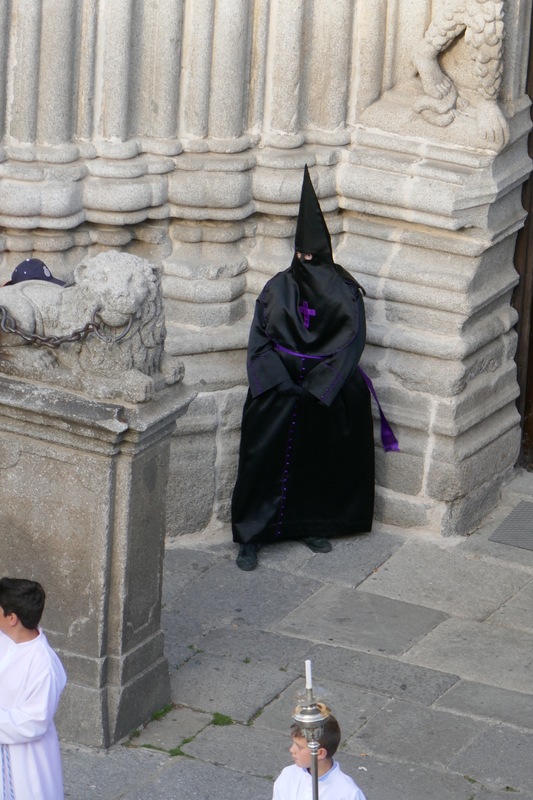 Some just hang around, waiting, or avoiding, even at the doors of the cathedral. Gloves on and ready but ….. The carriers needed a rest soon after starting, cross resting on poles they carry for that purpose, as they turn into their poles. Plus, two of the huge carts/juggernauts/tumbrels were carried. No motor. No rubber wheels, just man power. 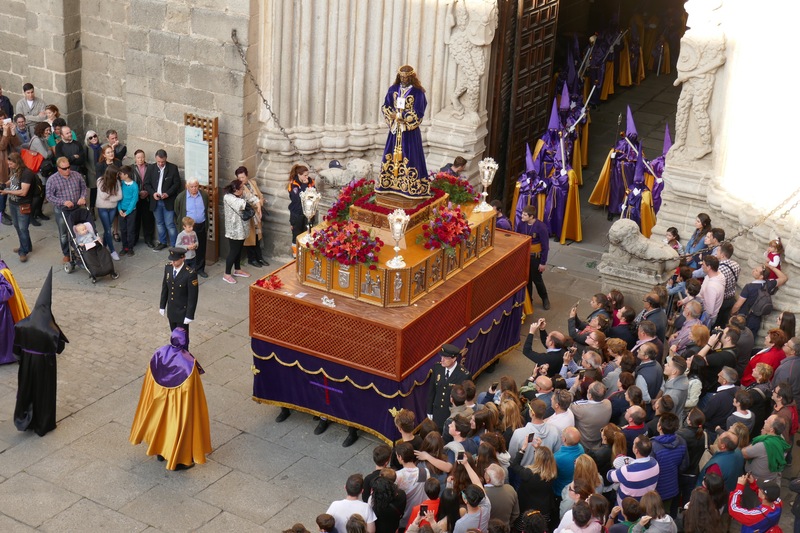 Three rows of men under each carrying the huge heavy thing on their shoulders. See the shoes poking out from underneath in the front? Every few minutes the guy walking in front of it stops, bangs a knocker on the top twice, then a third time and the thing stops. The men rest it on the poles some carry, often banging them on the ground once they start walking again, keeping time. Rest, then the knocker, then lift again and shuffle forwards. Christ, up on top of the bigger one, was swaying laterally, quite alarmingly, each time they restarted. The guy walking in front at times pushed on a side to limit the magnitude. 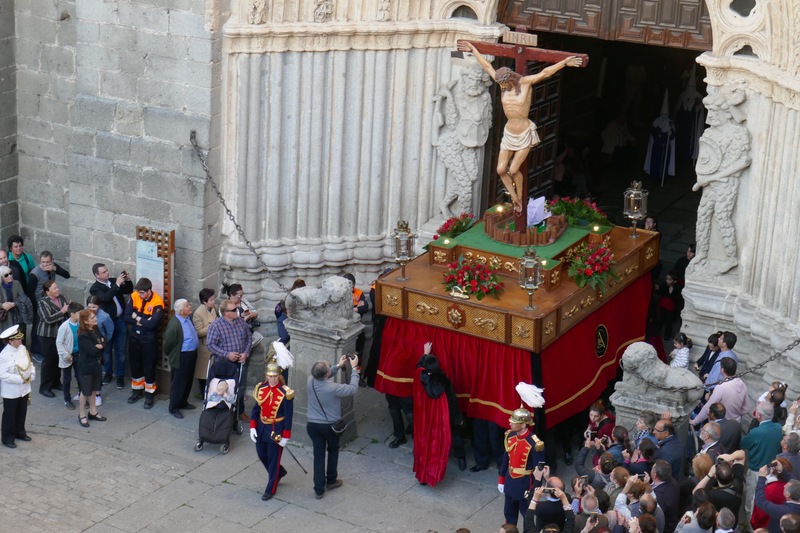 The most amazing time was when the one carrying Mary was turned at the doors of the cathedral so instead of ‘her’ facing in, she faced back towards the huge one carrying ‘Christ’. Imagine lines of men holding up the very heavy thing, unable to see out, turning it through 180 degrees. Very very impressive shuffling, step by careful step. And this occurred right at the end of the parade. Wow! During each stop, corner and turn the parade behind stopped, and waited. As there was always distance between marchers this didn’t impede the flow much. 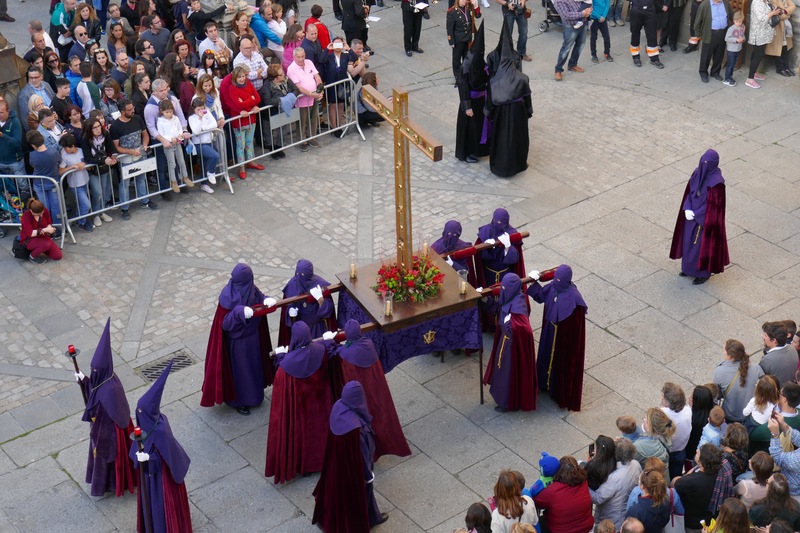 Now, the participants looked spectacular as they left the cathedral. Family affair? 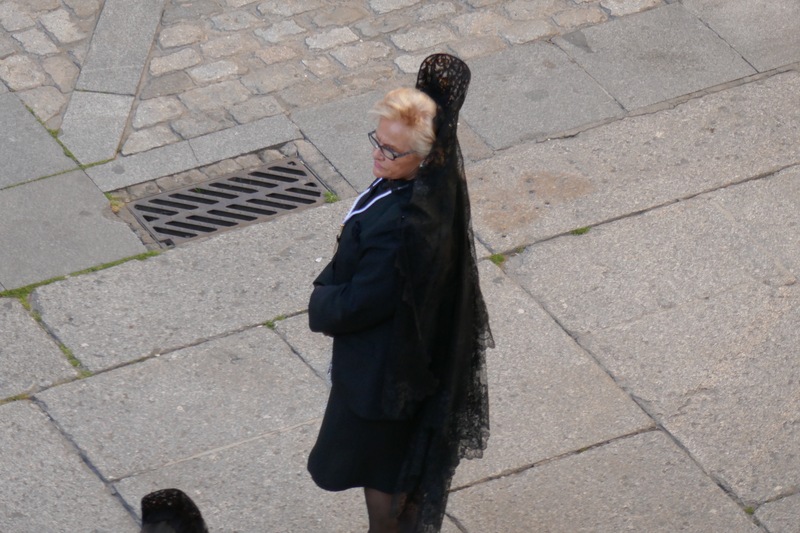 Another aspect I loved was the number of women in black with those quintessentially Spanish mantillas and combs, the high lacy bit worn on the back of the head and with a trailing veil. All veils are worn with the face uncovered. 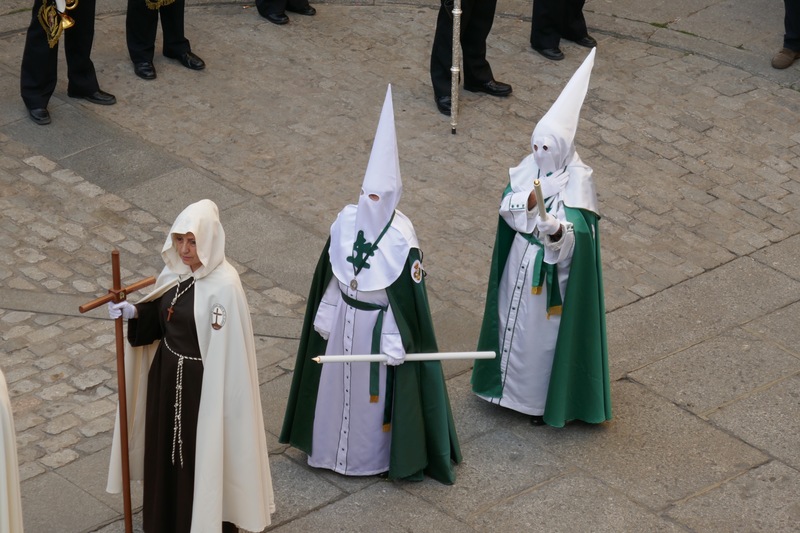 One of the papers had an explanation for the peculiar nature of the costume. Yes, women mourners wear it. 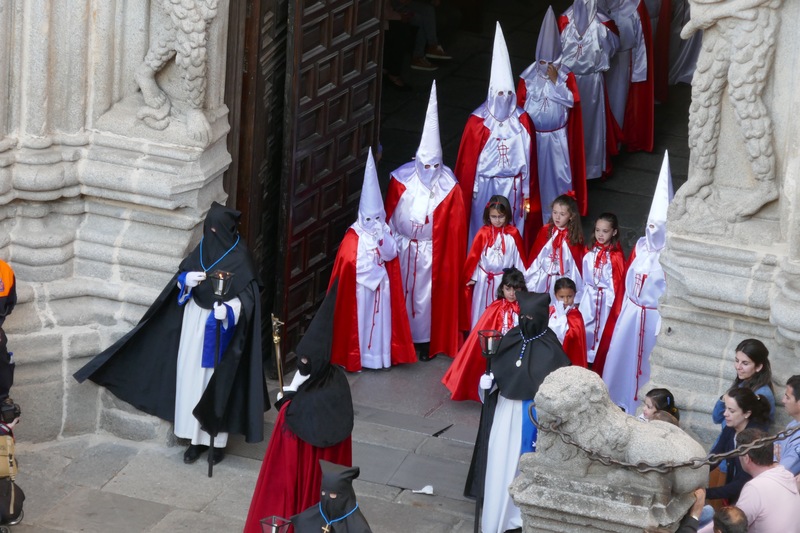 The fascinating thing is that when the cofraderies were formed in the 16th century, women couldn’t join as they would have to keep their faces covered under a hat (how times change). Covering faces wasn’t permitted for women. 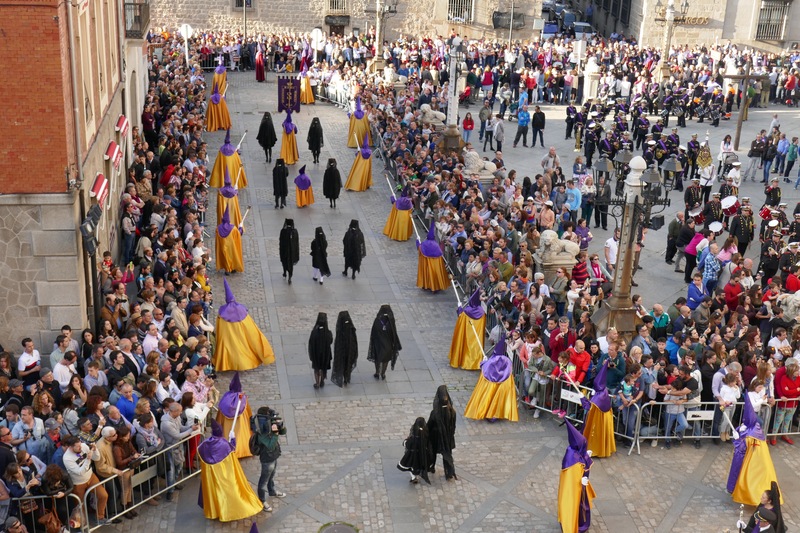 However, a particular group of women, in black, was later permitted to help behind the scenes with getting the parade ready. 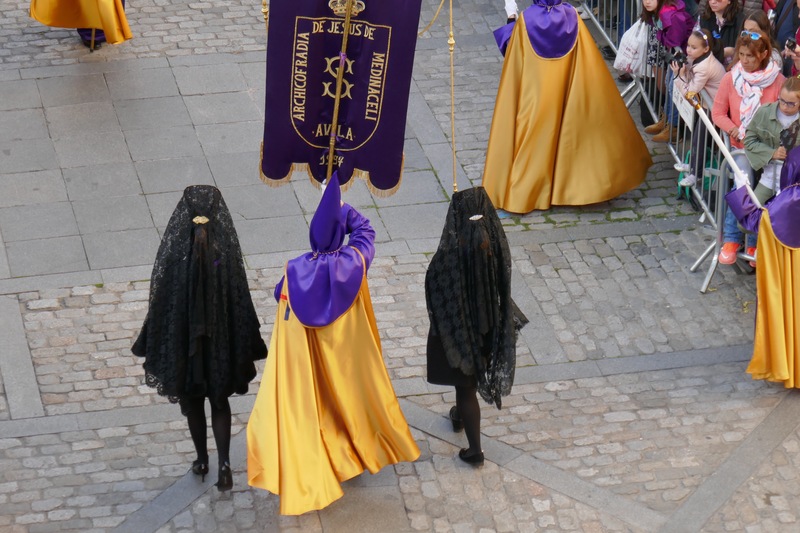 It was a small step for the women who parade, wearing similar black clothes, faces uncovered, to join in but not until late in the 19th century. The addition of the veil and comb is thought to have been originally in protest, or in imitation, of the aristocrats. 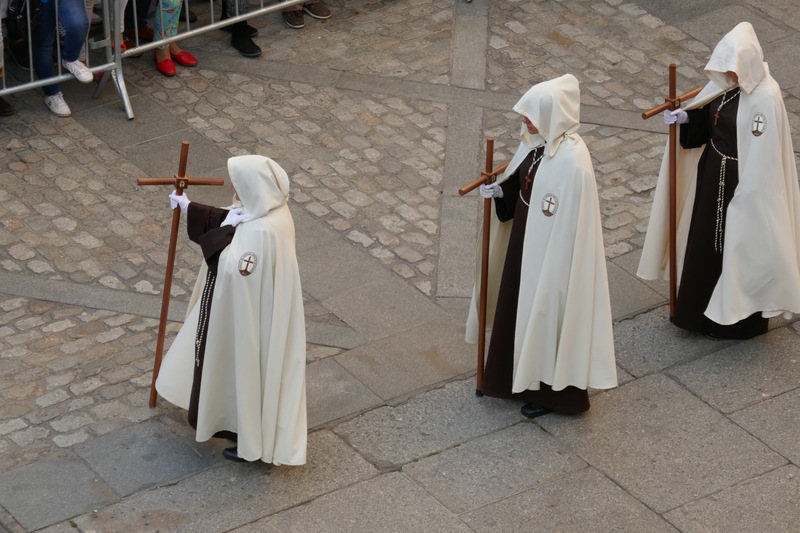 Wearing mourning clothes is said to emphasise the womens’ sorrow at the suffering and death of Christ. 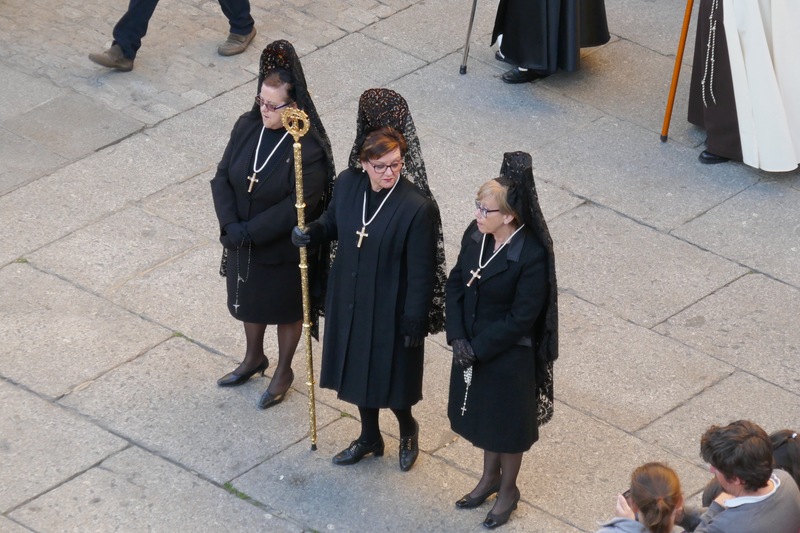 Women in black walking with the colourful costumes of the cofraderies emphasises the costumes of both. I can’t say strongly enough how spectacular these parades are. Note the veils and supporting combs. The little misses leading the red and white cofraderie were so cute. By the end of the parade the younger two were with adults. They did such a good job staying the distance. 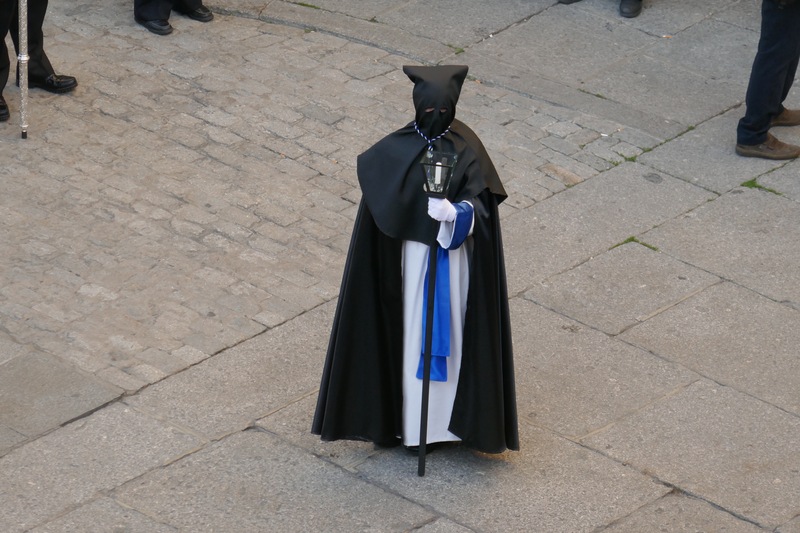 Manuel, my peregrino friend from the Camino Mozarabe from Almeria last year, is in a cofraderie. He said rum, or an equivalent, was essential before carrying as it was hard and he was a strong looking guy. Easy to believe as they do this for a couple of hours on cobblestones around the old city at a shuffling funeral pace. Another interesting point is the pervasiveness of the inclusion of women. Almost all civil defence and civilian groupings marching include women, and many cofraderies too. This occurs seemingly naturally, not in an obvious and tokenistic way as in some other countries. Good to see and not something I’d expected. See next blog for continuation…,..